Think of this article as a general guideline for designing any website. 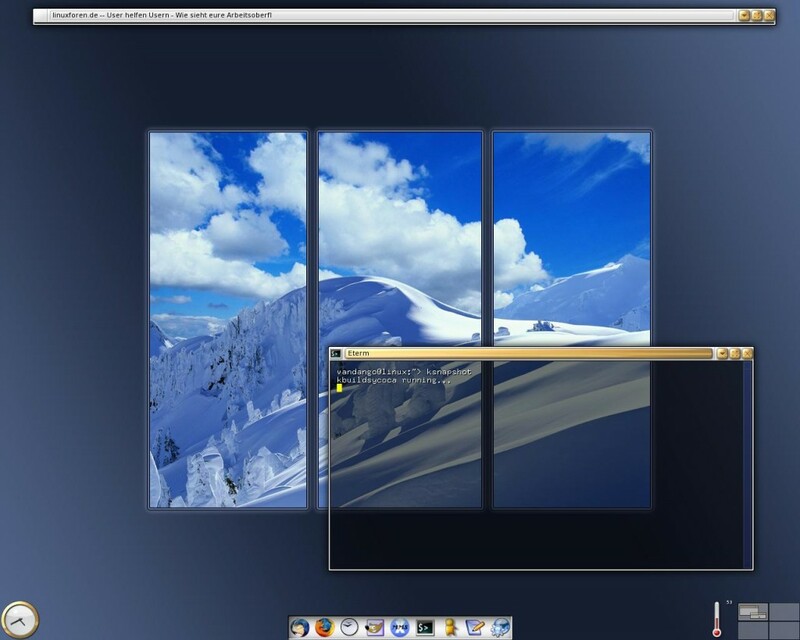 I’ve learned these lessons through photography, working in the Enlightenment Linux window manager many years ago, and developing for a design agency. I apply these rules while designing and building Recognize. Being able to do both has saved our team a lot of time and money. 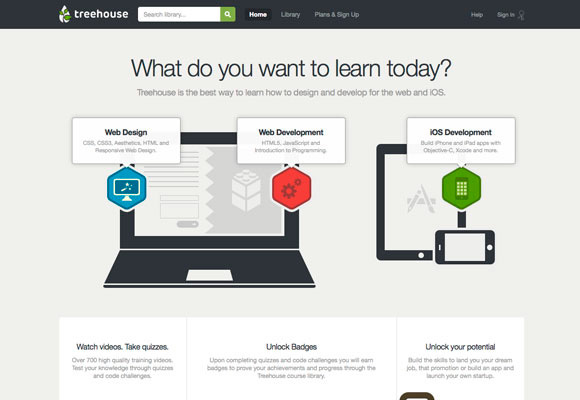 Learn to design along side your web development skills, and your value greatly increases. If you have to follow one rule, this is it. Farther in this article I will go through more specific examples of nature, such as the grid, 1.6 golden ratio, and following your senses. In the meantime, try to think more theoretical. 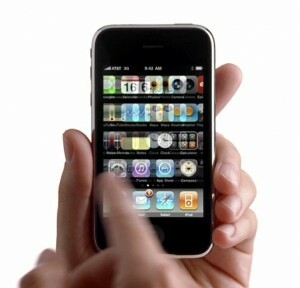 Think about Apple, and look at their web design and applications. 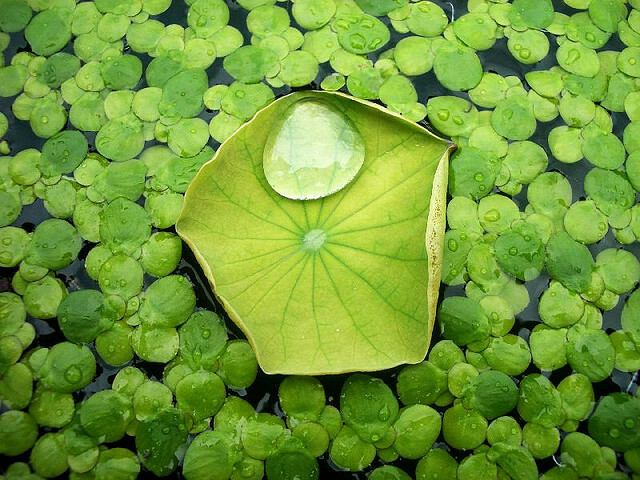 The reflections, subtle patterns, and momentum scrolling are all patterns taken from nature. Observe how light and objects behave, then mimic that in your design. Users will appreciate sensory experiences in your application. Tactile, visual, and auditory are all ways to stimulate your users. For instance, a button should suppress, or light up, when pressed. Next time you get in a car, press a few buttons. Try to mimic those behaviors in your application, and you’ll create a more realistic user experience. Android innovates with vibration responses. Most people say that their Android’s vibration response gives them a sense of context when a keyboard button is pressed on the screen. Android’s vibration is to iPhone’s momentum natural scrolling- they are both game changing user experiences. See how you can innovate with vibrations. Are sounds possible for your application? Auditory experiences are generally faux pas in desktop applications. Most apps steer clear and tend to indicate events through visual indicators, like updating the title tag. Still, audio if done right can add value to your app. But mobile is a different ballgame. When a push notification triggers a background service, play a sound to indicate a message or event. Give yourself a voice, and allow the user to know when an event occurs with a unique one of a kind sound. Remember ICQ and their weird ho-hoo jingle. Some try to fill empty screen real estate with pictures and useless text. Don’t fall for this fallacy. Apple is again another great example, they place the product in the middle of the screen and leave empty space around it. You’ll find people will be at ease with your design. Whitespace helped Google beat Yahoo. 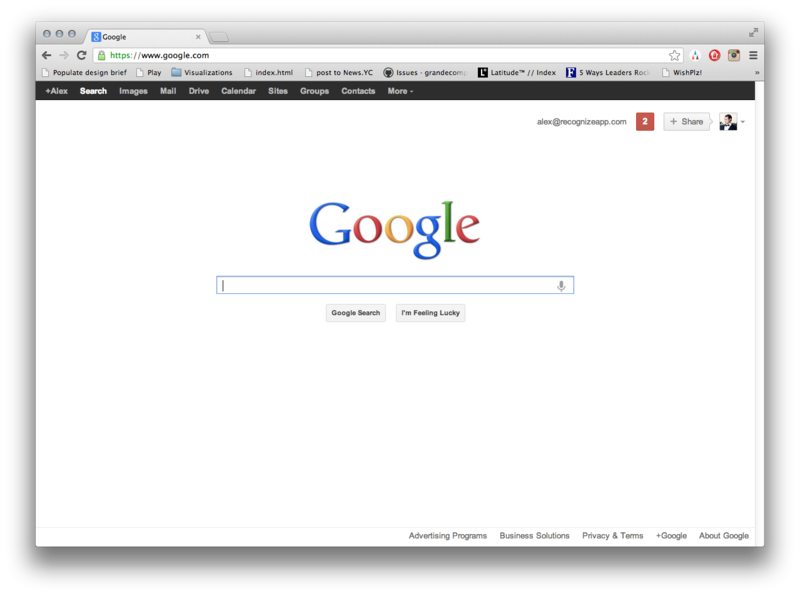 Google put the primary action front and center with nothing around it to distract the user. Embrace whitespace and start allowing your users to focus. What is the primary goal of your application? Keep that in mind as you make design decisions. Create a styleguide, a one page document with all the colors and styles. Create it in HTML and CSS. To make a styleguide, search and extract patterns from the designs. Things like paragraphs, headers, horizontal rules, and forms all can be included. Only allow two fonts. I tend to choose one embedded font used for headers and buttons. The other font is a standard typeface, such as Helvetica and Arial, for paragraphs and links. Keep your colors to a minimum. Create a colors.sass file to save the colors as variables. Choosing colors on future designs will be as easy as scrolling a short list of existing colors. Follow those four rules, your design will be consistent and well-maintained. Research shows if you tell a chronological story to a jury, they are more likely to believe your case. This heuristic is innate in humans and extends to all parts of life. Humans are storytellers and if you tell a good story, people will believe in your product. Storytelling is why vertical parallax sites are so popular. They create evocative storytelling. What’s your story, and how will it play out on your homepage? A/B tests indicate that the bigger the action button the better in homepage sign up conversions. If you beef up your headers and buttons, users will unconsciously associate your site with being larger than life. This is true for images as well, A/B tests have shown that fullscreen images, when used appropriately, can increase your conversion. 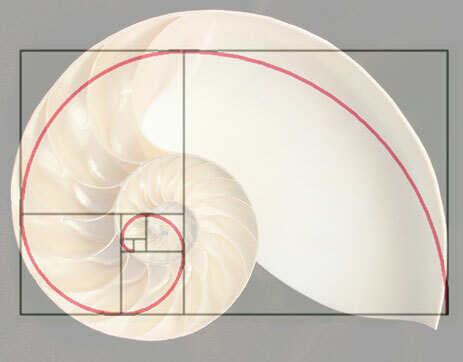 The golden ratio is found throughout nature. Trees, shells, and the Fibonacci Sequence all follow 1.6. You can use this simple ratio to your advantage when choosing header styles or how you layout your website’s columns. If your first header (h1) font size is 40px, try 40 / 1.6 = 25px for your header 2 (h2). 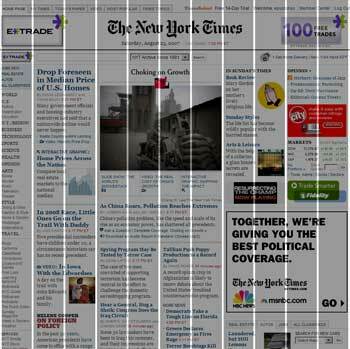 Grids are commonplace with the advent of responsive web design. Grids allow you to lay out a site using the golden ratio. It helps to set up your layouts following a grid in your styleguide. Grids, golden ratio, and storytelling are all part of our natural environment. Stay in tune with nature and your designs will be focused and simple. Fancy headlines and witty copywriting may be interesting, but if the user doesn’t know what your product does, they won’t want to use it. Come up with a few clear headlines. Test them out in person and using Google Adwords. Go with the slogan that most people understand and also gets the best Click Through Rate (CTR) on Google Adwords. If you aren’t sure how to proceed with a design, then shamelessly browse around on all the top sites. See what is happening on Behance, Bootstrap, Apple, or 37Signals. See how they solve an autocomplete list, an image carousel, or an user profile. Adapt your styleguide with their suggestions. After a night’s sleep revisit what you came up with, and create a better version. Innovation comes from copying. Copy away! Users read websites in the shape of an “F”. They browse down and run right to scan over content. I should note that sometimes people read in “E” shape, as shown in the image below. Here’s an article on that. If you are a web developer, you probably can skip the Photoshop step. Get out a big piece of blank paper and a pen. List out all the features you need to design. Rate the features in importance. Fit the features in order of importance in a grid or an existing layout. When the design feels good enough, jump into CSS and build a prototype. If Photoshop is needed, I take a screenshot of the website I’ve already built and paste it into Photoshop. It allows the designs to come out more realistic and I am able to Photoshop it faster. For Recognize, we hired a couple of fantastic designers to design our marketing site based off of our business requirements. Once the marketing designs were done, I used those styles in the rest of our site. A couple mockups acted as the design foundation for Recognize. Do the same for your business. If your design isn’t at the level of your business requirements, use Dribbble or Behance to find a designer that meets your style needs, and hire them. When you email them, ask if they know anyone else in case they are too busy for new work. Chances are they have a friend that is just as good. That’s the most important, if you are having fun you will want to keep trying and if you keep trying you will get better. Simple as that. Expand your mind by learning to design your own sites. This entry was posted in Design, DIY on April 29, 2013 by Alex Grande.